"In this otherwise humble gratin, we're going to use another, much more delicious delivery system of truffles: truffle pecorino cheese. For less than $10 worth of cheese, I think you can get a nicer, truer truffle flavor. By the way, if you know they actually make this cheese with synthetic truffle oil, please keep it to yourself, and don't spoil it for me." Preheat oven to 425 degrees F (220 degrees C). Butter a 9x13-inch baking dish with 1 tablespoon butter. Melt butter in a saucepan over medium heat. Whisk flour into butter; cook and stir until raw flour taste cooks off, 2 to 3 minutes. Gradually whisk milk into flour mixture. Increase heat to medium-high; cook and stir until mixture thickens and comes to a simmer, 5 to 10 minutes. Stir truffled pecorino cheese, salt, cayenne pepper, and nutmeg into milk mixture until cheese sauce is thick. Bring a large pot of salted water to a boil; add cauliflower and cook until slightly tender, about 6 minutes. Drain and transfer cauliflower to prepared baking dish. Spread cheese sauce evenly over cauliflower. Dust with bread crumbs, Parmigiano-Reggiano cheese; drizzle olive oil over the top and sprinkle with a pinch of cayenne pepper. Bake in the preheated oven until browned and bubbling, about 30 minutes. Garnish with chopped fresh chives. It was delicious! Added a bit more Cayenne & Nutmeg, but didn’t stray far from the recipe. 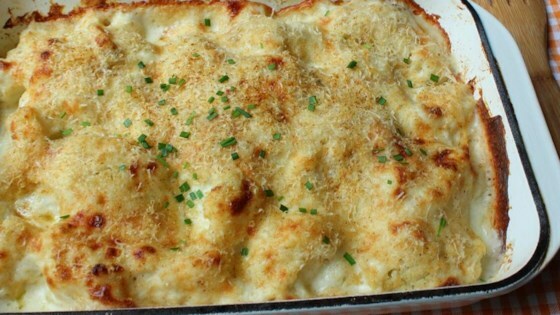 I have made this several times because it is so delicious and my husband loves it! It is worth the time and effort it takes to make it. Pretty nice way to do cauliflower. I didn't have the truffle cheese, so I used gruyere. But I probably won't make this again - it's very rich and high in fat. Sigh.